The Holiday Inn located in East Hartford, CT is tucked into an upscale corporate office park and within walking distance to Downtown Hartford. We're easily accessible from Interstates 91 and 84, only 12 miles from Bradley International Airport (BDL). Unwind with a workout in our expanded 24-hour fitness facility or with a few laps in our indoor heated pool. Bring friends and colleagues together at the newly renovated restaurant and our lounge. Host an event, and let our convention and banquet staff plan the menu and transform our newly renovated 9,000 sq ft into a memorable location for a meeting, conference, or celebration. We are conveniently located 2.4 miles from the famous Rentschler Field, home of the UCONN Huskies and near businesses, like Travelers Insurance, United Health Group, Aetna and many others. In addition, this smoke free East Hartford hotel is equipped with a 24-hour business center. 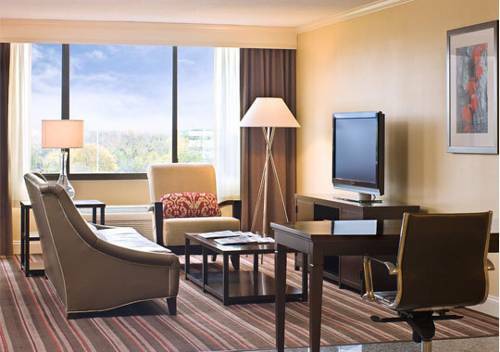 We know that business travelers appreciate being able to work on the go, which is why we offer complimentary wireless high-speed internet access and voicemail in every room. We also have a convenient work station set up in our restaurant with ample plug-ins and space to work while enjoying your favorite meal. Whether youre here for a meeting at the Connecticut Convention Center or catching a show at the XL Center, we're here for you. The River Walk: Full service restaurant and lounge located inside the hotel. Hartford Golf ClubThe Hartford Golf Club has 27 holes of superbly-conditioned parkland golf. It was created with the golfer who plays the game for enjoyment and adventure in mind. Founded in 1896, the course is a combination of Donald Ross and Devereaux Emmett design. Bushnell ParkBushnell Park, the city s oldest public park, was seriously distressed just two decades ago. The Park s landscape and landmark sculptures such as the Memorial Arch were in disrepair when concerned citizens formed the Bushnell Park Foundation in 1981.